Loved finding this recipe on Epicurean Vegan, and loved her substitutions. I made it the way she did and it was delicious. For step-by-step photos, visit her blog. Keep in mind – barley takes about 40 to 50 minutes to cook. Add water, broth, and barley to a pot and bring to a boil. Once boiled, cover and turn down heat. Let simmer for 40-50 minutes. Using a food processor, puree the tomatoes, onion, and ginger. In a large saucepan, heat the oil over medium heat; add the curry powder and cardamom; cook for 30 seconds. Add the puree and raisins to the pan. Simmer for a couple of minutes until it start to thicken. Stir in the vegetables, garbanzo beans, and coconut milk. If it’s too thick, add a bit more coconut milk. Season with salt and pepper, if you’d like. 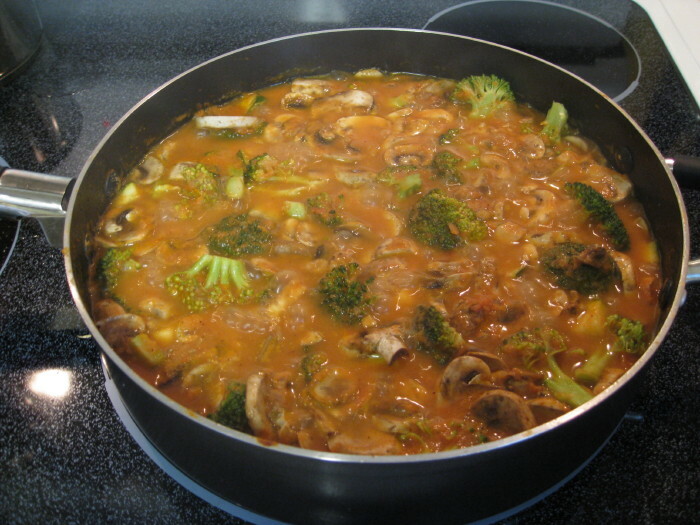 Cover and reduce heat to medium-low and simmer for 15-20 minutes, or until veggies are tender. Serve over the barley, sprinkle with the almonds, and enjoy!